Early this morning, the Dark Souls successor, Sekiro infiltrated the libraries of gamers all around the globe. While there is mostly universal acclaim for the game, there are lots of people stuck on the game’s first main boss, the Chained Ogre. Even though I spent 2 hours on it after defeating the game’s first optional boss, I enjoyed every second of it. Just like the Dark Souls series that this game is inspired by, difficulty is one of the core aspects of the game. While I was fighting General Naomori Kawarada and the Chained Ogre, I was very pleased with my progress, even though I was dying a lot. From this initial difficulty, I have learned tons about the deep mechanics of the game. 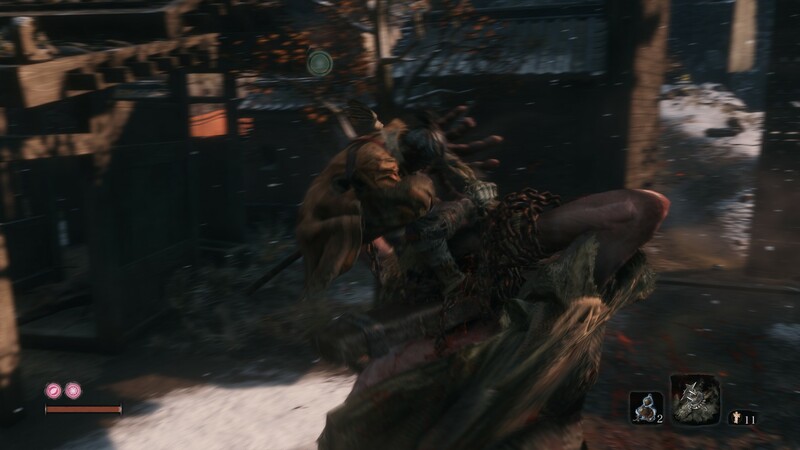 From Kawarada I learned how the posture bar and parrying worked, and from the Chained Ogre, I learned the importance of eavesdropping and side stepping. Me going in for the killshot on the Chained Ogre after countless hours. While the sword and stealth mechanics are amazing on their own, they are deeply improved by being rewarded through intense trial and error. Even though on the outside it looks like the game does nothing but beat you down, it lifts you up through rewarding an obvious improvement in gameplay over time. You have to be very precise with your moves. The difference in length of one fingertip is the difference between an instant death and defeating the boss you have been stuck on for 5 hours. Precision is key in this new title, and you have to pay close attention to succeed. This makes for some interesting battles where it feels like two advanced minds fighting instead of the player mindlessly killing robots. This makes for much more replayability with varied actions and routes to take. This difficulty also opens up your creative thinking and forces you to think through alternate paths and strange strategies to defeating tough enemies. For example, I defeated the Chained Ogre by setting it free from its chains, hiding it, and waiting until it turned it’s back. I then stealth attacked it for one of it’s two health bars. I only had to fight through one of the frustrating boss’ health bars instead of two, which I am starting to think is impossible. I am sure that I will be playing this game for much longer. I will be doing a second playthrough to come back to all of the hidden content that I miss along the way, and will also spend time than more people just due to my skill level at the Soulsbourne games. I will be slowly chipping at this game for much more time to come, and enjoying myself along the way.